It seems that I am able to accomplish so much more during the summer months. Maybe those of you with little ones can relate? With all of the girls home playing together and no school schedule, afterschool activities, school obligations, etc. to think about, I seem to get into a much more productive flow. 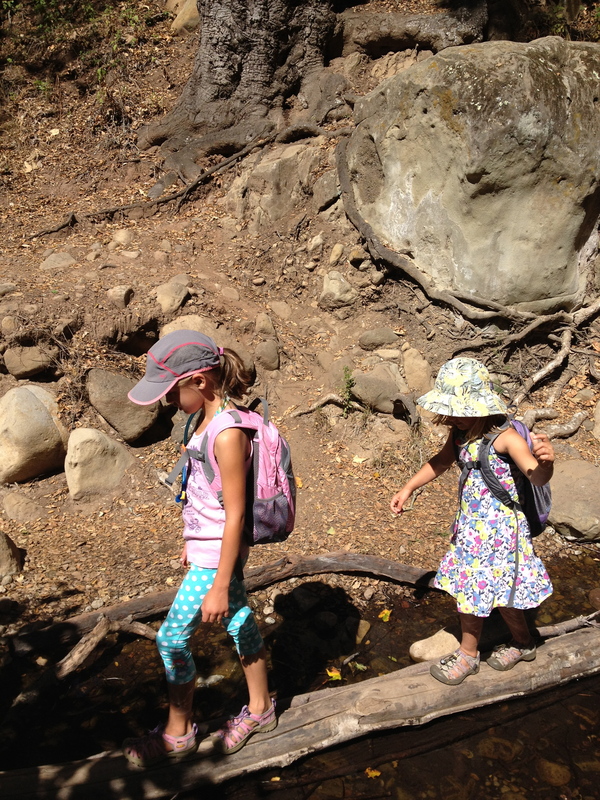 Of course there are the much cherished hours spent at the beach, on the hiking trails, visiting with friends, etc. but there are still many days in between that allow me some valuable “work” time. Anyway, I realize that my “productive flow” – as well as my long, summer days spent with my girls- is nearing its end ** deep sigh** as school will be starting back soon. So I have been trying to get a few projects underway in hopes that the momentum will keep me going. Last week I finished up my Untitled Improv quilt top. Now I’m waiting for some fabric I ordered to arrive so I can make the back and start quilting!! Any ideas?? I have no idea yet how to quilt it! I got started this week on a new design using all solids again. I’ve had triangles on the brain for a while now. I had a little go at them here but have been wanting to try this type of layout, possibly influenced by Katie’s amazing quilt. 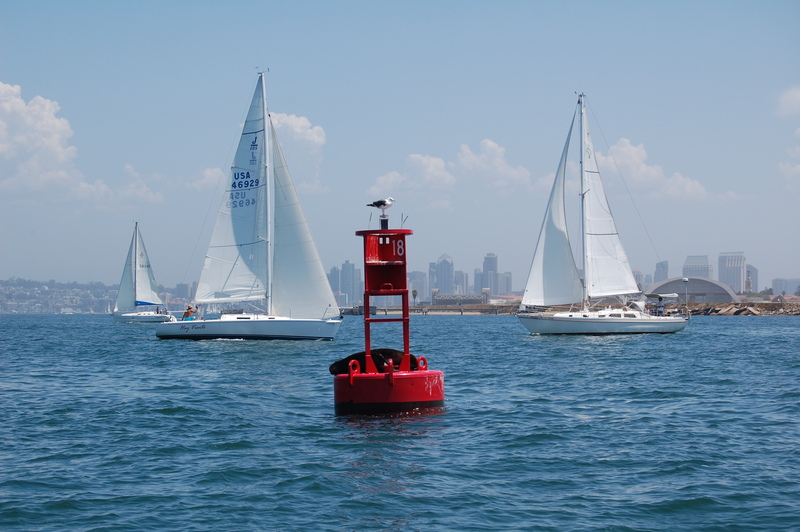 I also found much inspiration however, on a recent family outing on my in law’s little fishing boat– which I neglected to get a photo of…..
We spent the day cruising around the harbor, catching a few fish, admiring the sailboats, and joyfully jumping into the water. It was clear to me that day, that I had a quilt design I needed to get started on as soon as I got back home. Of course, I have a hundred or so more photos of the day, that would illustrate my inspiration further, but you get the idea-right? I’m still playing around with some color details- possibly taking out that olive green and adding grey instead? ?– I decided to go with my original color intuition and leave that green in after all- and specific layout. Again, I’m stuck waiting on a Kona blue I needed to order more of- that’s what the blank spaces you see are waiting for! In the fabric waiting interim, I started on another new quilt, which I will have to show you later as it is too late at night to get any good photos of it. I’ll give you a hint– fabric frisbees!!!! I’ve worked with them before! As far as Miss A’s bed quilt blocks and my scrappy strings quilt go– they are taking a little WIP “vacation”, along with my Bella Triangle quilt whose pebble quilting progress got the better of me– for now anyway!! I hope you’re all having a lovely week so far! I’m linking up with Lee’s WIP Wednesday!! As always, lots to admire over there…….. 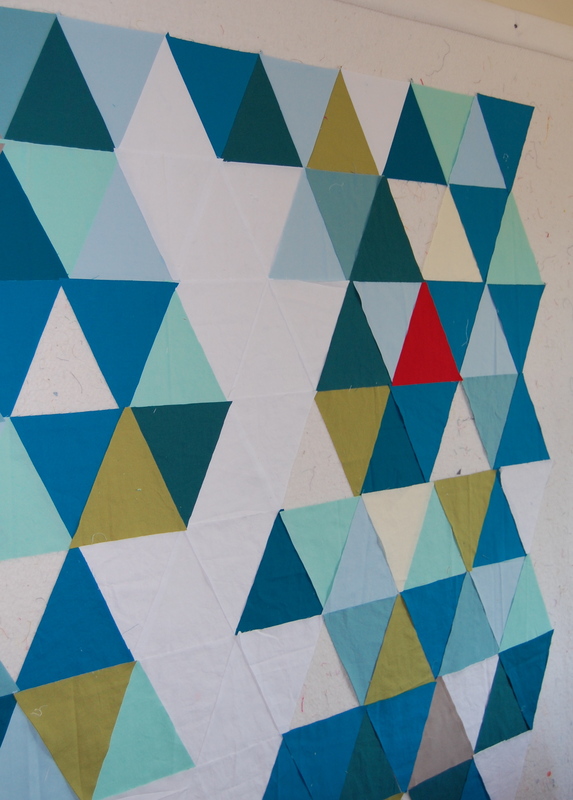 I really want to make a triangle quilt too, your solids are soooo good! The boat day sounded so perfect! I also love the modern style of you improv quilt! It looks really awesome! Great projects! Love the new design. I’ve been thinking about making a triangle quilt too. They look great in solids. I also think the olive green is just the right punch of a different color! I think the olive green looks amazing, and that the grey would have less impact. Beautiful quilt so far! I love the triangle design!! Such beautiful projects you have on here. Love those triangles!! don’t take out that olive green! i love it so much!!! Love the all solids and the triangles! I agree with the others, keep the green. I also think that using the sailboats as inspiration will help you when you create your quilting pattern (maybe something water-ish). Great ideas. 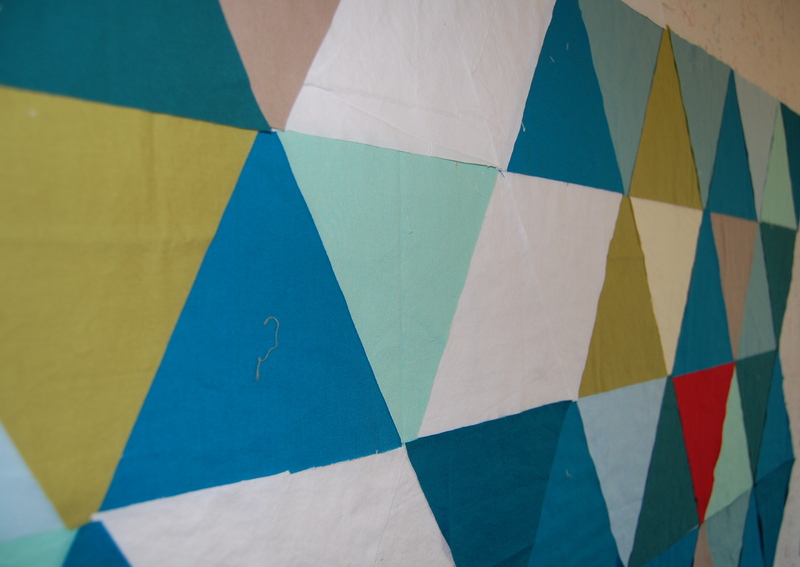 you know i actually like the blank spaces in the triangle quilt? love the finished quilt top. 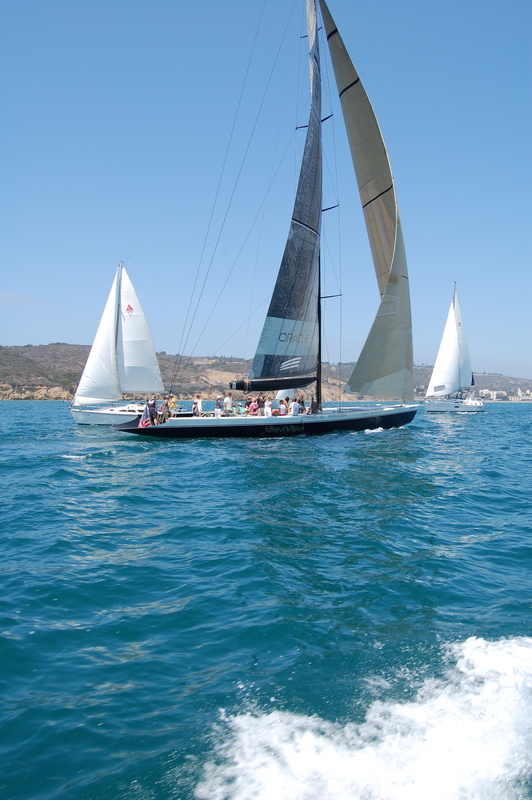 Beautiful sailing pictures and I love the triangles that were inspired. Thanks for linking up! I love your improv quilt, I am so drawn to the way you are able to work with mostly neutrals and just small bits of colour. And the triangles also look like fun. Really great triangles! (I also super love Katie’s triangle quilts.) 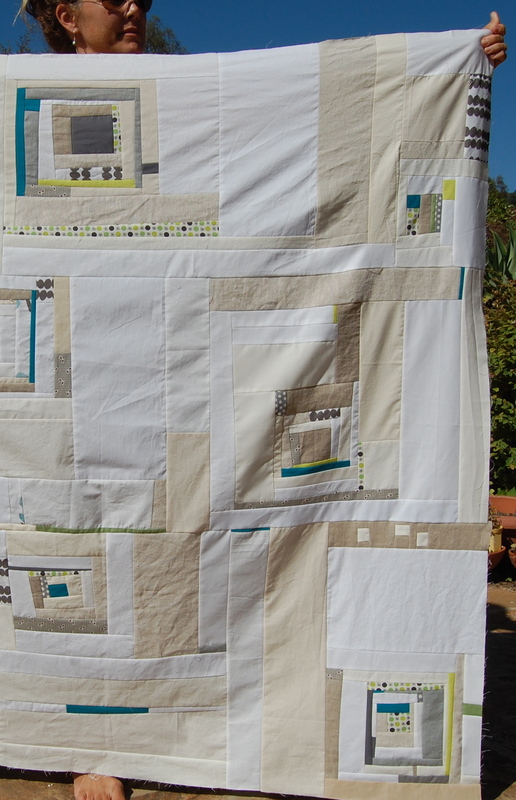 And that mostly neutral quilt is just gorgeous. love.